Intuitive Password allows you to change your account email address at any time even when your account has been created but not yet activated. If you are unable to receive メールアドレスが変更できません。 from Intuitive Password servers, or you've signed up with a wrong email address by mistake, you may follow the instructions below to change your email address. 1 Navigate to the メールアドレスの変更 page. 2 Enter your old account email address and password to verify your identity. 3 Enter a new email address that you wish to use. You have to enter it twice to confirm it. 4 Enter the メールアドレスが変更できません。 and click メールアドレスの変更. Once your email address has been successfully changed, you will need to verify your email address to ensure it works with Intuitive Password. Note: You can use this page to change your email address only when your account has not been activated. If your account has already been activated, you will need to login to your Intuitive Password account before being able to change your email address. 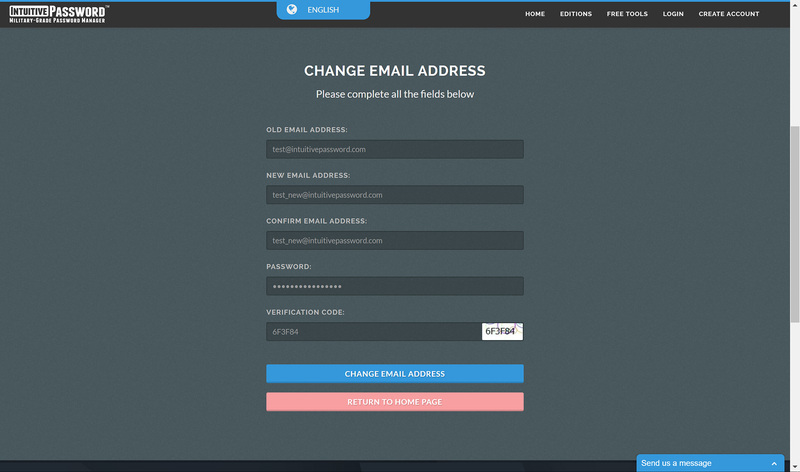 There is another tutorial available on how to change your email address after your account has been activated. I cannot change my email address on the メールアドレスの変更 page, even though I have entered everything correctly. The メールアドレスの変更 page is designed for changing an email address of a user who has not yet activate their account. If your account has already been activated, please follow the instruction here on how to change your email address.